Would you like to learn how to make your own homemade soap? If so, you will want to continue reading, because my friend, Karen is going to teach you what you need to know to make your own amazing homemade soap. She has been making soap for years and knows all about it. Making homemade soap at home is a lot like cooking, you need a recipe, the ingredients, and some kitchen utensils and tools. Just like cooking, you need to take measures to protect yourself. You don’t want to cook carelessly, you could get burned or you could cut yourself. To be a safe cook we need to be alert to possible dangers. Homemade soap is made by mixing oils and fats with a caustic chemical that changes the fats into something that becomes soap. The caustic chemical that we use is sodium hydroxide, or more commonly called “lye”. In the old days homemade soap makers extracted lye from wood ashes. Lye today can come from a couple of sources. One that surprised me was sea water or salt. The biggest threat to a homemade soap maker is getting a chemical burn from lye. A burn can come from getting the lye water on your skin or in your eyes, or possibly from breathing the fumes that lye makes when it is mixed with a liquid. Even though lye is a common ingredient in many products from pretzels to toothpaste, it is important to take steps to prevent a chemical burn from making lye soap. Many people worry about using lye soap, but once lye water and fats are combined and have fully saponified and been cured for 4-8 weeks, the lye is no longer lye but soap. A vapor mask to help prevent breathing fumes. Never breath in air where the lye fumes are, even when wearing a mask. Turn your head away to breathe. Clothing; Long Pants, Long Sleeve Shirt, Closed Toe Shoes & Socks. If you wear glasses or bifocals have them handy for reading directions. When making handmade soap your best protection is cover. Cover your body with clothing and shoes. If you do have a spill, it will get on your clothes instead of your skin. Warning: Do Not Make Soap Without Using These Basic Things. If you do have a spill, remove all wet clothes and flush with water and then vinegar those skin areas that have been exposed. If you get lye water or fresh soap batter in your eyes flush with water only and seek immediate medical help. Not only will you need to protect yourself when making soap, but you will need to also protect those in your family or household. Only make homemade soap when pets, children and spouses are sleeping or out of the house for the day. 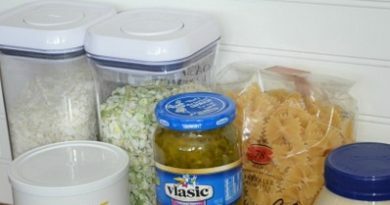 Never use anything to store lye water that resembles a food container. Label everything you use to store lye, lye water or wet soap batter. Ventilate, open windows and turn on exhaust fans in the area to remove any lye fumes that might be in the air. Soap making accidents can be prevented if all opportunities for accidents are eliminated. Having children, pets and spouses present can be dangerous because you never know when they will get under foot. Imagine having a container of lye water in your hands and you trip over the baby or a pet, not good. Before you begin to make homemade soap consider where you will be working. Do you have good ventilation? Have a window open to let any fumes escape. Can you walk around without stepping over something? If you have anything in your path move it and make your work area free of things that you could trip over. When making soap always have vinegar handy, vinegar neutralizes lye. If you get lye water on your skin you should flush with water then splash with vinegar. Vinegar will stop the burn. Never add water to lye, always add lye to water or other liquid. When adding water to lye you risk causing a extreme reaction and a possible eruption of lye and water that could get on you. The following saying might help you remember, comparing lye to snow: “The Snow Flakes Fall On The Water” Always add lye to water. Laundry – This Laundry homemade soap recipe has been formulated for washing laundry. It will not make suds like regular soap does, but will still clean your clothes. Of the three recipes this is the strongest most harsh. DO NOT USE on your skin. You might even need to wear rubber gloves when handling it. Just be aware and be careful when handling it. Kitchen – This Kitchen homemade soap recipe has been designed to be used for washing dishes and other household cleaning. DO NOT USE this soap to wash your skin. Like the laundry soap, it has been formulated to be stronger than regular soap that you would normally use on your skin. You may find that you need to wear rubber gloves when handling this kitchen soap. Go slow and test it out. Personal – This Personal homemade soap has been created to be used on skin. There is a degree of super fat built in to buffer the harshness of sodium hydroxide. Super fatting is similar to reducing the lye, it leaves excess oils that make a milder bar of soap. All Recipes: All Real Homemade Soap Can Sting If It Gets into Your Eyes. Be careful and make an effort to keep soap out of your eyes. If you get soap in your eyes flush with water. If stinging and burning persists seek medical attention. These recipes are unscented and fragrance free, reducing many toxic chemicals that would normally be in scented soap. When mixed, each batch will make about 50 ounces of wet soap, so be sure to choose a mold that will hold 50 ounces. Any scale that can measure in tenths of an ounce and can weigh 5 – 10 pounds will work. Not only do I use my soap scale for making soap, I also use it for weighing other things like packages that I am shipping. Actually I use it for weighing anything that I need weighed that isn’t too heavy. The second tool you will need is an immersion blender. You can get an inexpensive one at Wal-Mart or many other big box stores, or keep your eyes open when at garage sales or second hand stores. I love to use this Kitchen Aid immersion blender when I make soap. Unlike the scale, you would not want to use your immersion blender in anything other than soap or other personal care products. In other words, do not use it to make food after using it for making soap. 2 or 3 gallon heavy duty plastic bucket with lid, the kind that you would use for food storage. Stainless Steel Pot large enough for melting your fats. Heat Resistant Spatula, the Dollar Store sells these. Large wooden spoon for stirring soap batter. Large spoon for scooping fats. Bowl for measuring the lye. 16oz measuring cup for weighing water. A soap mold, can be a heavy duty Rubber Maid container or a heavy duty box lined with parchment or plastic wrap. Knife to cut your soap. A tray or box to put your soap in while it cures. I like to use trays, but an open box or other container would work. WARNING: Do not use these for making food after using them to make soap; plastic bucket, plastic spatula, and wooden spoon will all absorb some of what they are exposed to. Some soap makers say not to use anything for food that you have used for making soap. 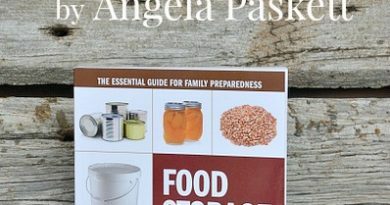 I have not had any trouble re-using my stainless steel pans, metal spoons and glass containers for food after washing them. Be cautious and do what you think is best. Petroleum Jelly to “butter” the mold to keep the freezer paper or plastic wrap liner in place. Freezer Paper since some molds will be better with freezer paper as a liner. Plastic Wrap to line plastic molds. Vinegar: just cheap vinegar to neutralize the lye in case of spills or splashes. This tutorial will teach you to make the easiest of all the soap making methods, Cold Process. Cold Process soap making is not totally cold, in spite of the name, since you will need to melt your fats, but once your fats have been melted you will not need a heat source. The rest of the process is done without added heat. Also, mixing lye with water is not a cold process because when lye is mixed with water or other liquids it creates a very hot mixture. You will need to take this into consideration when handling lye water to prevent getting burned. Hot Process soap making progresses the same as cold process until the soap batter is ready to pour into the mold. In the hot process method instead of pouring the soap batter into a mold you would transfer it to a pot on the stove, the oven or to a crock pot. You then cook it until the soap is fully saponified. Hot Process takes skill and knowledge of basic soap making techniques to be successful. It is recommended to take soap making in steps of the least complicated to the most. Cold Process soap making is the beginning step for learning the basics of soap making, where the hot process is an advanced soap making technique. When you are experienced in the Cold Process Soap Making method you might like to learn the hot process. Not only can you make solid bar soap, we use the hot process along with Potassium Hydroxide (lye) to make liquid soap, in cold process we use Sodium Hydroxide (lye). You can find my “Hot Process” Liquid Soap Making Tutorial here! Please read through this tutorial several times before making your first batch of soap. Gather all the things you will need in advance of starting. Never make soap when children, pets or spouses can get in the way. Always use the safety gear to protect yourself, and don’t worry, it is easier than it might seem. Butter inside of Mold with Petroleum jelly. Line Mold with pre-cut liner – (freezer paper or plastic wrap). Set lined Mold aside. Weigh Distilled Water – Add it to your heavy duty bucket, cover with the lid. Set Bucket in the Sink. Open the windows in the room where you are making the soap to ventilate any fumes. Weigh Sodium Hydroxide (lye) – slowly add it to the bucket of water. Do not pour all the lye in one spot. Carefully pour it over the whole surface of water. You do not want to have a large lump of lye in the bottom of the pot of water, that could be difficult to break up causing a splash or spill. Slowly and carefully stir lye crystals into the water, being careful not to splash lye water out of bucket, then cover the bucket with the lid. With a Stainless Steel pot on the scale, zero out your scale and set it to measure in ounces. Then one by one measure the fats and the oils into the pot, zeroing out the scale between each different fat and oil addition. Next put the Stainless Steel pot on the stove, set to low, leave until the fats are melted. One more time, go back to your lye water and carefully stir it to make sure that all the lye crystals have dissolved. When all the lye crystals are dissolved and your fats are melted it is time to add the oils and fats to the lye water. Slowly and carefully pour your melted fats and oils into the bucket with lye water. With your immersion blender on low slowly begin to mix the lye water with the fats and oils. Be sure to keep the mixer head of the blender submerged in the soap batter to prevent soap batter from being thrown out of the bucket. After your fats, oils and lye water are mixed you can increase the speed of the immersion blender. I take mine to the highest level, but take your time and make sure you can handle the speed before mixing on high. Blend the soap batter 5 minutes on and 5 minutes off until your soap batter reaches the trace stage, it may take 5 -30 minutes. Trace is the stage when making movements in the soap batter stays on the surface and does not disappear quickly. I like the thick trace stage, but if the homemade soap batter gets too stiff it will become hard to get out of the bucket. See the graphic above for images of trace. When your soap reaches trace it is time to pour into the mold, see the graphic above. I like to put my mold filled with soap into my oven over night to set up. I do this in a cold oven since a warm or hot oven could cause the homemade soap to melt, or puff up and out of the mold, ruining the soap and making a huge mess. The day after making the soap, and after it has set up, is usually the time to cut the homemade soap into bars. Take soap from the mold and remove the paper or plastic wrap. If for some reason you have trouble getting the soap out of the mold you can put the mold with soap into the freezer for an hour, then try again, it should come out easier. If your soap is not too soft cut it into bars, whatever size or shape you like. Place your cut bars of soap on a try or box to be put in a cool dry place out of the way to cure. Curing time is usually 4 weeks, but I like to have a longer cure of 8 weeks or more since it makes a harder longer lasting bars. 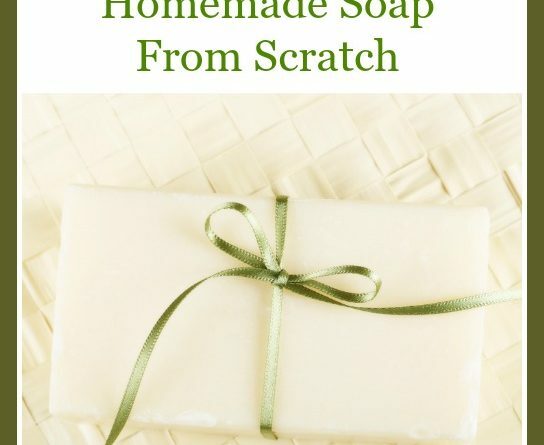 If after reading through the instructions you feel you would like more information and step by step pictures you can find more information in the post Learn To Make Homemade Bar Soap From Scratch! Karen is the owner and author of Blue Yonder Urban Farms (https://blueyonderurbanfarms.com), where she shares her 16 years of homemade soap making experience in tips, how-to’s, and homemade recipes for several different types of soaps. Karen is a survivor of Multiple Chemical Sensitivities. This often preventable disorder was brought on by the use of several pharmaceutical and fragrance chemicals. Not being afraid to talk about it, Karen shares her insights and experience in an attempt to help others avoid this tragic illness. Aside from authoring and maintaining her own site, Karen also helps fellow bloggers follow their dreams by sharing her knowledge and skills in setting up self-hosted, WordPress sites. Thanks Karen for sharing such an informative guide to safely making homemade soap. 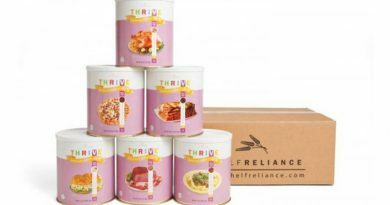 What Does Freeze-Dried Meat Look Like?